One of my kids' favorite toys when they were young was a Mr. Potato Head. I still remember when my mother bought me one. Mr. Potato Head has not declined in popularity over the years. If your children enjoy playing with this toy, you may want to make a felt version. The felt version is perfect for preschoolers who are learning their body parts. Cut out a large oval from a brown piece of felt. This is your Mr. Potato Head base. Cut out four circles from a sheet of white felt. These will be eyes. Glue green, blue, or brown circles inside the white circles to create different eye colors. You may have a set of green eyes and a set of blue eyes when you're all done. Attach small pieces of Velcro to the back of each eye. The other side of the Velcro strip should go on the brown oval where you'd place Mr. 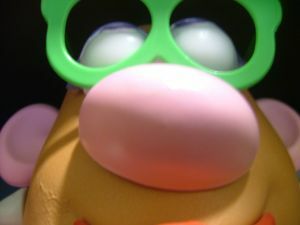 Potato Head's eyes. Cut several noses out of the felt. You can use a flesh colored piece of felt, or a big red triangle. Anything your child will identify as a nose. Attach a piece of Velcro to the back of the noses. Cut some teeth out of white felt and a set of lips from a piece of red felt. Again, these need Velcro. Create some additions that your child might like, such as a hat, wig, ears, arms, or shoes. Each needs a piece of Velcro on the back with a matching spot on the Mr. Potato Head base. Your child can create a Mr. Potato Head with some of the pieces, remove them, and use other pieces. He or she will be able to play with the homemade Mr. Potato head many times without getting bored. How do you evaluate knitting advice?